Corporate America is full of big successful companies who reward their investors nicely and have a winning management strategy. There are two companies that are consistently making progress, growing, and paying dividends. They go by the name of McDonald’s and Starbucks. Both of these companies success could be attributed to their management strategy. As of late one of their management focuses is to keep their push on international expansion. 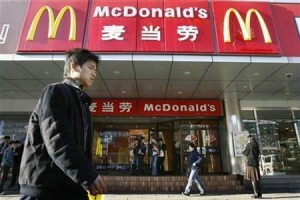 Both companies have a great global presence and China remains a strong point for them. Starbucks recently opened 500 new stores in China, bringing the total to 1500 in the country. McDonald’s is currently working on diversifying their menus in top countries such as China. Hiring great leadership and accountability are also two strategies that are strong in both companies. Starbucks company founder Howard Schultz continues to come up with innovative products to expands the company’s product portfolio. An example of trying to retain top talent and hold managers accountable was in late 2012 when McDonald’s let go of former head of US operations Jan Fields, as the companies earning were disappointing. Another strategy that is seen in both companies is the constant flow of product diversification. McDonald’s continues to broaden its product portfolio by offering high quality coffee and healthy drinks. They offer these products in their traditional restaurants and their cafes. Also, Starbucks founder Howard Schultz continues to introduce different products. Year in and year out, McDonald’s and Starbucks are the most social companies in the world in the restaurant business. 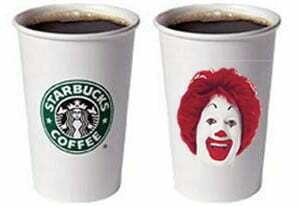 Recently it was said that Starbucks lost its position to McDonald’s as the most social company. The main reason was that in late 2012, McDonald’s put up a campaign of what goes down in behind the scenes and it also opened up to any questions from the public. Because of this McDonald’s social reputation and audience has been on the rise ever since. As we can see, management strategy plays a big role in both of these companies as both them continue to grow and show profit. New product innovation is huge for both of these companies. McDonald’s rolled out the McCafe in order to compete with store like Starbucks and Dunkin Donuts. In my opinion, this was a great success. I have many friends that actually prefer McDonald’s coffee to Starbucks and Dunkin Donuts. The day I found that out, I was in utter shock, as I did not think people would be going to McDonald’s for their morning coffee over companies such as Starbucks and Dunkin, where coffee is their specialty. The question that comes into play is do McDonald’s and Starbucks have what it takes to keep up in their industries, continue to introduce a wide range of products, and produce at such a high level? In my opinion, there is no doubt that both of these companies will continue to succeed on the same as they are both industry leaders. What are your thoughts on this subject? Has Starbucks Met its Match? The popular coffee franchise has made a statement in a number of different markets, but has it met its match against Vietnam? The Seattle based coffee chain put its first location in Ho Chi Minh City in February. This country is known to have a very specific way of making coffee; nothing like what Starbucks has in the U.S.
Another critical decision is location strategy. Now, Shultz did not just wake up one morning and decide he wanted a new location in Vietnam. There are currently over 3,000 locations in Asia alone. Starbucks in fact purchases a large quantity of Arabica coffee from Vietnam, thus building a location in Vietnam makes a lot of sense. If they can move closer to the supply, this could greatly reduce exporting costs. To be even more specific, Starbucks purposely located their café in the capital’s higher-end neighborhood, District 1. Here, those that live in the area can afford the expensive taste that Starbucks has. Starbucks essentially nailed it on the head when it comes to this aspect: they are now near raw materials, and they are near to their target customers. 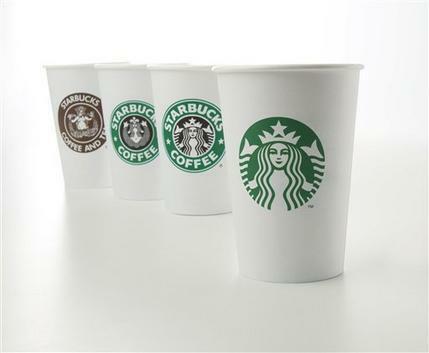 Going global has given Starbucks a vast amount of knowledge on how to succeed. However, they also face some cultural issues as well. As I stated before, the type of coffee served at Starbucks in the U.S. is much different than what the Vietnamese are used to. They enjoy a more bitter and higher caffeinated drink, and in order for Starbucks to do well, they must adjust to the new scene and roll with it. They have also brought a roast-duck wrap and a French baguette to the menu to achieve this goal. Overall, I believe Starbucks has done an amazing job going global, and if they review and understand the critical decisions of operations management, they will continue to strive to new levels. Will Starbucks succeed in their takeover of Vietnam? Why or why not? What does this mean for local coffee shops? As we discussed in Chapter 2, cost leadership is one of the keys to achieving a competitive advantage over the opposition. Having the lowest cost, as perceived by the customer, without sacrificing quality, is the key to beating the competition. Starbucks is attempting to do just that by cutting the price of its bags of coffee by $1 per bag this year. This reduction in price would make the cost of their bags of coffee comparable to those sold by Folgers, Maxwell House, and Dunkin’ Donuts, all of whom cut their prices this year as well. Ultimately, Starbucks’ goal is to draw sales away from their competitors, even if they aren’t making as much money per bag of coffee. The rationale behind the cut in price is to attract a new demographic to purchase their product. Currently Starbucks’ in-house coffees are among the most expensive, yet they continue to outsell the competition. By selling their bags of coffee for about the same price as their competitors, they are able to attract the lower end of the socioeconomic ladder, as opposed to just the upper end. Assuming they aren’t sacrificing quality, the Starbucks brand bags of coffee would be the best available option to these consumers. Overall, they would be reaching a much wider market then their competitors. In order to earn as much revenue on bags of coffee as they did last year, Starbucks would have to sell 65% more bags at the new price. Starbucks knows they probably won’t achieve those numbers, but if they continue to steal customers from their competitors, they will eventually reach that number and eventually sell even more. The move also forces Starbucks’ competitors to make a tough decision. Either they can keep prices where they are at, or they can continue to cut their prices and trim profits. Another possibility is that they can cut volume. Either way, Starbucks walks away a clear winner. At the rate they are going, Starbucks is slated to run its competitors out of business. I think this is a great move by Starbucks. It’s no mystery that a majority of Americans prefer Starbucks coffee to other brands, and by making it more widely available, they can increase their sales exponentially. Sales won’t increase immediately, but in the long run they most likely will. Once consumers realize they can get their favorite, high-quality coffee for the same price as lower-quality brands, odds are they’ll opt for the higher quality product. And even though the profit margins won’t be as high for the bags of coffee, they will still be huge on the in-house brews. In the end, Starbucks has the highest quality coffee on the market as chosen by consumers, and at its new low price, Starbucks will have the competitive advantage as well. Starbucks is currently in the midst of launching their newest product, the Verismo single-cup espresso based beverage machine. The Verismo has unique pods that contain coffee and milk, and when used together, can product a latte. This machine has a unique new sleek style, to better fit on top of a kitchen counter, and is also capable of making shots of expresso. This machine is going to be sold at high- end kitchen good stores such as Sur La Table, and Williams Sonoma, as well as in select Starbucks locations. It will be priced at $199 and and the larger version will be priced at $399. Previous data has shown in the last year only 4% of coffee makers made a profit from selling espresso machines. This means starbucks is taking a large risk entering the espresso machine market. Chief Executive, Howard Schultz, stated in his most recent interview that Starbucks is making a bet with this new machine. So, with last year espresso machine sales at a mere 4%, and the Chief Executive officer admitting that this is a big risk, why would Starbucks enter into this market? Well, I believe we can look at Chapter 12, regarding Operations and strategy in a global environment, for some answers. 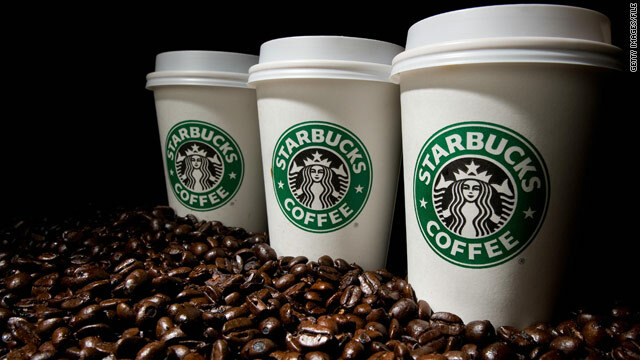 Starbucks has one of the most, if not THE most crucial advantage over competitors; Starbucks has brand recognition. Starbucks differentiates themselves from other coffee shops because they provide an “experience”, which sets them apart from the rest of the many places you can get a cup of coffee. But, their newest product launch had nothing to do with this in store “experience”, rather, it is about bringing Starbucks “experience” into your own home. The competitive advantage is about differentiation, cost leadership, and response. Starbucks new Verismo machine touches upon all three, with a strong emphasis on differentiation because there are currently are no other machines like it on the market. According to our book,Competing on differentiation means, “the uniqueness can go beyond both the physical characteristics and service attributes to encompass everything that impacts the customer’s perception of value- and in this case, the Starbucks customer values their own time, their coffe, and their loyalty to the brand itself. I think this coffee maker will be successful? Will it be a positive thing for Starbucks? What strategies and data do you think Starbucks is using to make sure sales of this machine are successful? The operations managers job is to provide competitive advantage and increase productivity… Do you think the OM Manager is doing this in this instance?